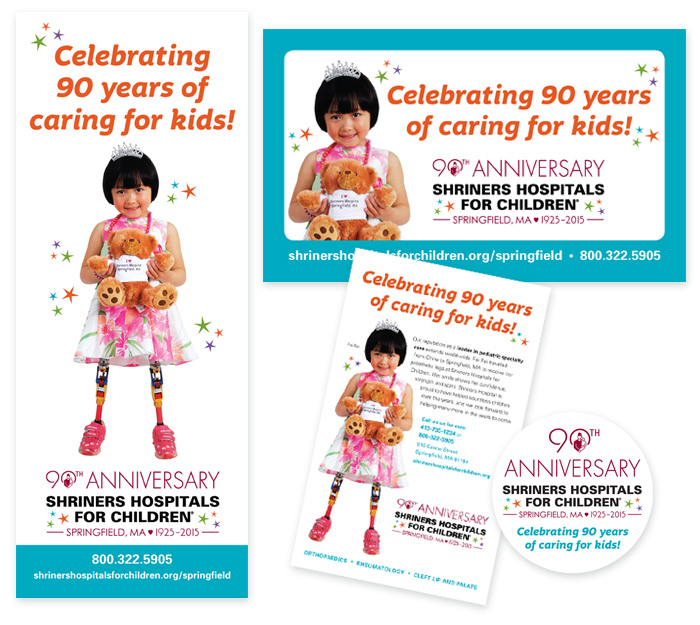 Kathleen Doe Creative Design recently created signage, advertising, and promotional materials for Shriners Hospitals for Children – Springfield, to celebrate their 90th anniversary. Kathleen collaborated with Shriners Hospital to customize the 90th anniversary logo, and to create billboards, banner stands and signage, print ads, party invitations and tickets, and promotional materials including buttons and stickers. Shriners Hospital is proud of this milestone, and is celebrating with the local community. On all the materials, a little girl named Fei Fei is featured, who traveled from China to Springfield to receive her new prosthetic legs. Her confidence, strength, and spirit are representative of the countless children Shriners Hospital has helped over the years. Shriners Hospitals for Children – Springfield delivers world-class orthopaedic, rheumatology, and cleft lip and palate care within a compassionate, family-centered, and collaborative environment. Their staff is dedicated to improving the lives of children by providing pediatric specialty care, conducting innovative research, and offering outstanding teaching programs for medical professionals. Children up to age 18 are eligible for care, regardless of the families’ ability to pay. > Learn more about Shriners Hospitals for Children – Springfield.